Does my Home Insurance cover Roof Leaks? Did you recently discover a roof leak and are wondering if it's covered by your insurance? The damage caused by a roof leak can be sudden and significant, often affecting multiple rooms and even floors! It’s no wonder that one of the first questions asked by homeowners after discovering a roof leak is whether this will be covered by their homeowners insurance. Coverage determinations for roof leaks can be rather complicated however, with everything from roof condition to cause being considerations. Here, we address common coverage concerns and how homeowners insurance generally applies to roof damage and roof leaks! As always, for coverage questions specific to your policy and circumstances, please contact your local insurance agent, who will be able to assist you. While homeowners insurance generally will cover interior damage that results from a roof leak, the roof repair itself will depend on the cause of the roof leak. As a general rule, homeowners insurance covers you for damage caused by sudden and accidental incidents unless specifically excluded. What this means is that sudden and accidental damage, such as hail and storm damage would generally be covered, while maintenance issues such as roof shingles that are in poor condition would not. 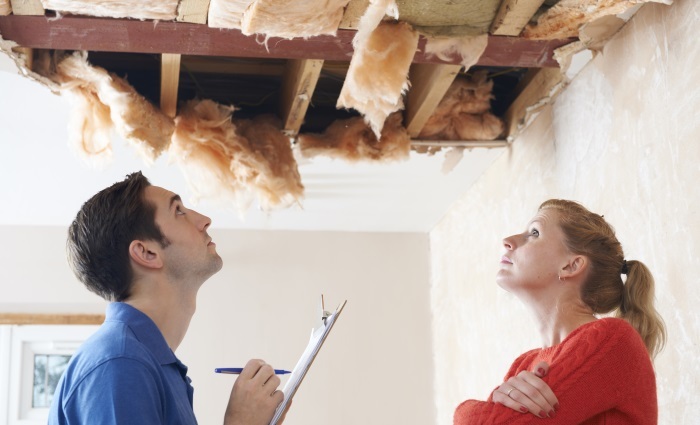 Does home insurance cover interior damage caused by a roof leak? Generally, yes. Even though your insurance company may deny coverage for the roof repair itself, the Interior Damage will often be covered. This is because, while the roof damage may be the result of a maintenance issue, the interior damage is still sudden and accidental. What about interior damage that occurred over a long period of time? Because roof leaks often occur in areas where homeowners can’t immediately see them (attic spaces, ceiling and wall cavities, etc. ), it’s common for Water Damage to occur over a long period of time before being discovered. While insurance is intended to cover damage that is sudden and accidental, many insurance companies recognize that damage is not always “foreseeable”. What this means is that, while interior damage from a roof leak may not be “sudden”, it may be suddenly apparent to you, and as a result, is often determined to be covered. Does home insurance cover tarping the roof? Home insurance does normally cover steps to prevent further damage, such as tarping the roof. It’s important to understand that, regardless of whether your insurance company covers or recommends roof tarping, you are obligated under your insurance policy to take all necessary steps to prevent further damage. In fact, one of the most important things you can do initially is to have the roof tarped as quickly as possible to prevent further water intrusion and interior damage. Many homeowners may not realize, but your insurance company can deny coverage for subsequent additional damage that may result from a homeowner neglecting to take proper steps to prevent further damage. Never attempt to tarp a roof yourself, as this is extremely dangerous. Always hire a qualified contractor or roofer to perform this work for you. Pests: If you notice an increase in pests such as bugs and rodents, it’s very likely you may have a hidden moisture issue in ceiling or wall cavities. Roof Condition: Inspect your roof periodically from the ground, looking for signs of missing or damaged shingles. Your roof should be a secure and intact barrier against mother nature and all shingles should be laying flat. Signs of curling or cupping of shingles indicate that your roof is near the end of its lifetime and will need to be replaced. Water Stains: While you’ll likely recognize a water stain on your living room ceiling as a serious issue, that’s not the only place you can see water stains. Take some time to inspect your attic area looking for any water stains, wet wood, or drips that may indicate an issue with the roof. These water intrusion indicators often occur prior to the water reaching a living space and may save you from a much more involved claim. Weakened Materials: Particularly in the case of wallpapered walls, you may not notice water staining. Instead, you may notice pealing wallpaper or weakened drywall. You could even have pictures fall off the walls as they weaken to the point that they can no longer securely hold the nail! Any time you see signs of weakened materials, moisture is not far away. Wood Rot: Most commonly noticed in attics and above windows, wood rot is an indicator of long term water damage. Often, further investigation will reveal this damage to be the result of a hidden roof leak. We hope this answered all of your questions about roof leaks and insurance! As always, if we can ever be of any assistance, please do not hesitate to Contact Our Offices!